The time has finally come. I have just completed my 6th block and it has come time for us to walk out of the doors of this amazing institution. In all honesty, it has come to an end quicker than expected. The feeling of leaving the doors of Kendall is bittersweet. The thought of leaving didn’t hit me until my last day of class. Reflecting back on how the two years passed brought a tear to my eye. It finally hit me that I won’t have any more classes, I won’t be in an environment where I can make mistakes, I won’t be able to see my friends and professors every day or also not be able to experiment and the thought of all the things that I would miss at Kendall came flooding back. Kendall College was my second home. I was thinking about the number of hours that I had spent either in the kitchen, at work or just hanging out and I came to the conclusion that it was too many to count. This quarter breezed by and it feels like just yesterday that one of my chefs told us that it would all be over before we knew it and oh boy! how he was right. During these last three months, I have gone through classes with people I will never forget. I have gone through classes like fine dining production, fine dining service, Quantity Service Production and a few others. During fine dining production, we got the opportunity to serve food to the public in the fine dining room which is Michelin recommended. We also had to prepare a special dish that we had to come up with and it was entirely prepared by us as individuals. 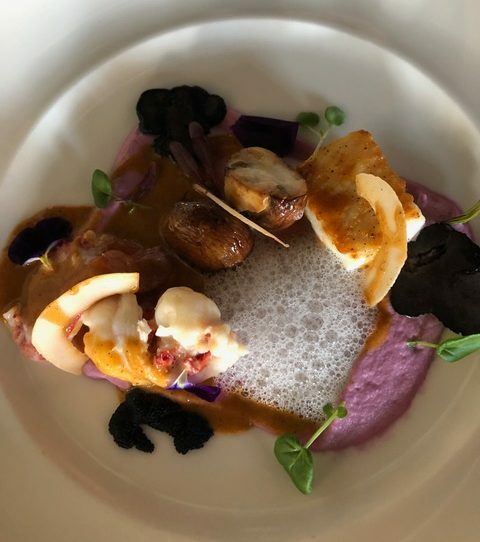 For this special I had prepared a butter poached lobster with a lobster and truffle sauce, pan seared halibut, Indian spiced purple cauliflower puree, lemon & rosemary foam, and harissa spiced coconut chips. 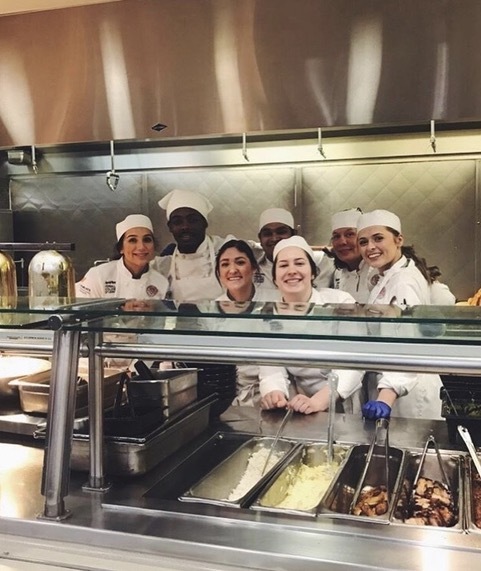 In our fine dining service class, we got to experience how the front of the house works. We had the opportunity to be servers and got to see the other side of the stove which was interesting. During QSR we had to prepare dinner for the faculty, staff and students. We also had the chance to create another special dish which would be served. 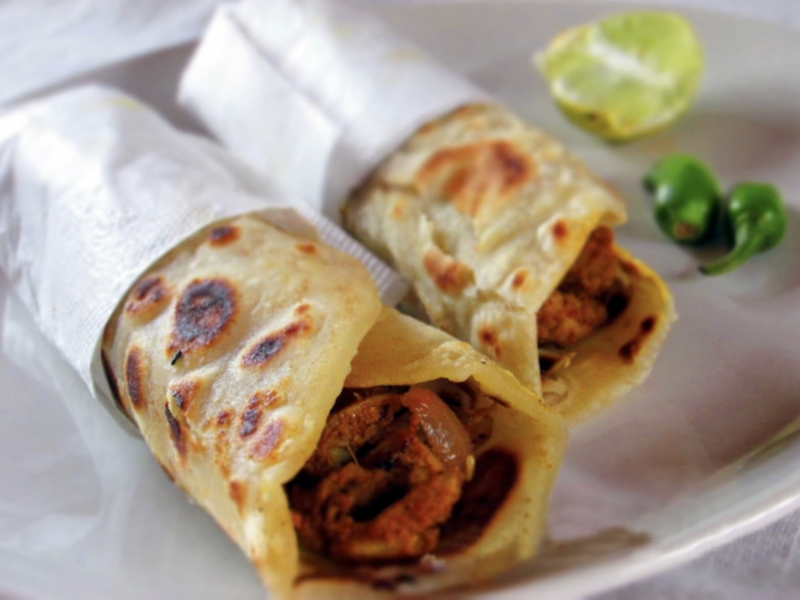 I came up with a famous Indian street food called Chicken Kathi rolls which is a soft paratha ( which is an Indian flatbread) with a spicy chicken mixture, an omelette, onions two ways, a tandoori mayo, tamarind habanero reduction and mint chutney. This quarter has been a ride but it was one of the best quarters that I have been through. In the end, it was all worth it. I would like to shoutout to each and every person who has made my time at Kendall the best from the moment I walked in till the moment I walked out. Dear Kendall College this has been a blast. Thank you for everything. This is Bradley signing off. Butter poached lobster with a lobster and truffle sauce, pan seared halibut, Indian spiced purple cauliflower puree, lemon & rosemary foam, and harissa spiced coconut chips.